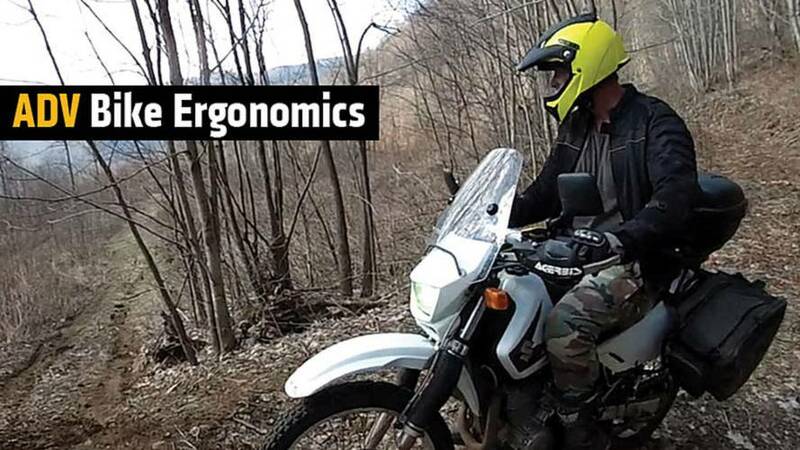 When handling Adventure Bikes, ergonomics become more important and complicated than on standard motorcycles. 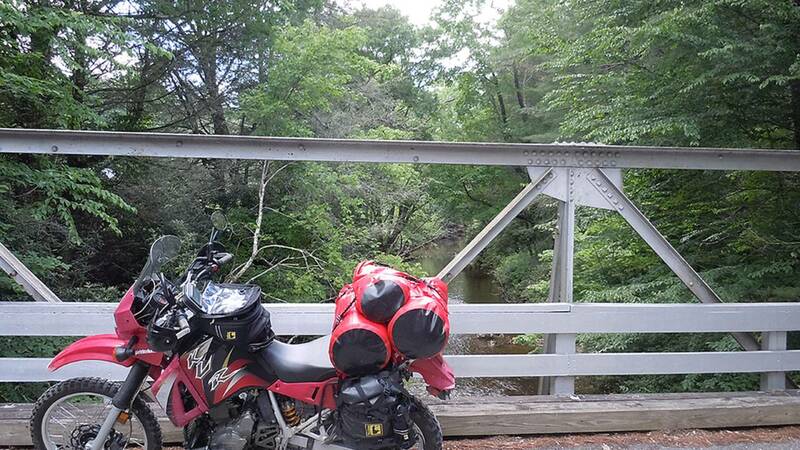 Ever since I took my very first dual sport ride I have been upgrading and changing my 2004 Kawasaki KLR 650 to suit my riding needs, and you should too. 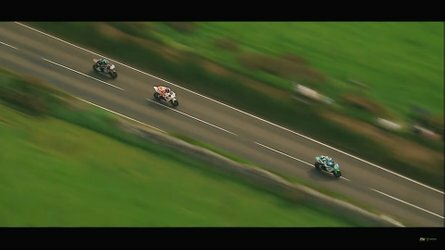 With all types of motorcycling, ergonomics are vital, but adventure and dual sport riding present different challenges. Ergonomic upgrades make a big difference in comfort and handling. When you get your bike set up right for your riding style, you can go farther and faster with less fatigue. 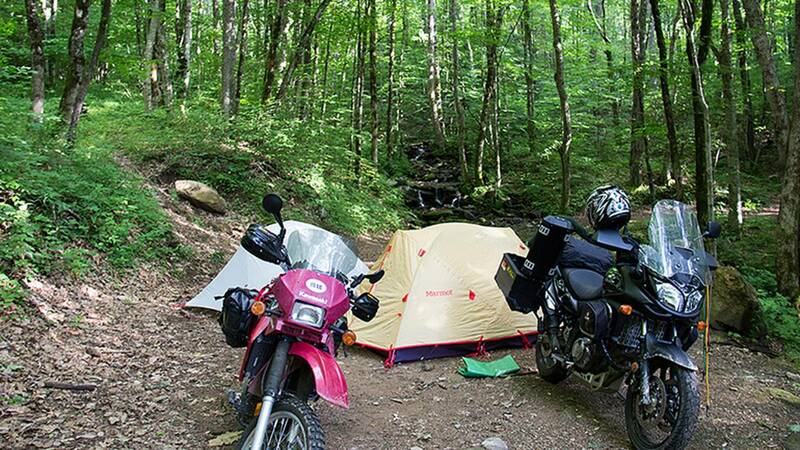 An ADV bike is heavy and meant to be ridden on long trips with rough terrain. You should set your bike up so that you can comfortably ride while sitting for those long stretches of slab, but stand up at a moment’s notice to control the weight of the bike in the rough. Not all bikes fit all riders, so what if yours doesn’t fit you right? We have a few options on what you’ll need to make your bike more comfortable to not only go farther, but faster. There are a few factors that come into play with handlebars. You have height, pullback and width. You need to experiment, but height can be changed through the addition of bar risers (often cheaper option) or bars with higher bends. You want to find a height that is comfortable while sitting, but it also needs to work while you are standing. 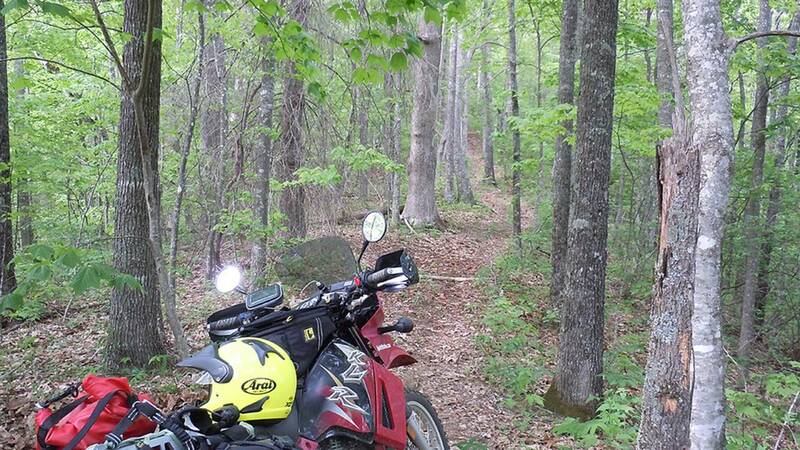 For example, my stock 2004 Kawasaki KLR650 bar made me bend over a lot while standing. Bending over too much will tire you out and too much weight is resting on the bars resulting in poor control. After raising my bars I can ride longer and with better control. Since I am not stooped over anymore I can climb steep hills without my shoulders screaming with fatigue and I can keep my eyes on the trail without a crick in my neck. Pullback refers to how much the bar ends bend back towards you. Some riders like the bars to be straight and some riders like the bend to help them keep their elbows close to their body and wrist slightly bent. 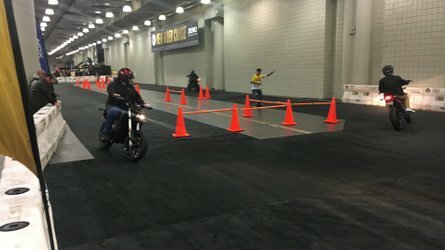 The best thing to do is sit on your bike with your eyes closed and put your hands out where you think the grips would be comfortable, then open your eyes and make adjustments to try and match your natural position. How your hands and shoulders line up with the bike play a major role in comfort and how much leverage you have over your handlebars. Wider is easier to rotate the bars, but go too wide and a sharp turn will make you have an awkward reach. Your controls need to be comfortable while sitting and standing. 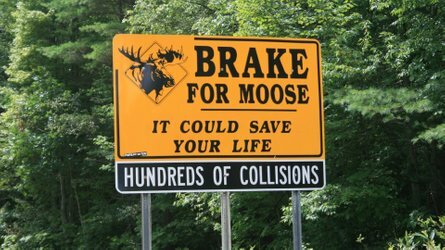 Usually, this means you need to point the lever down about 45 degrees. Breaking levers is a common problem when riding offroad. To reduce your chances of damage, you can cut the ball end off the levers. 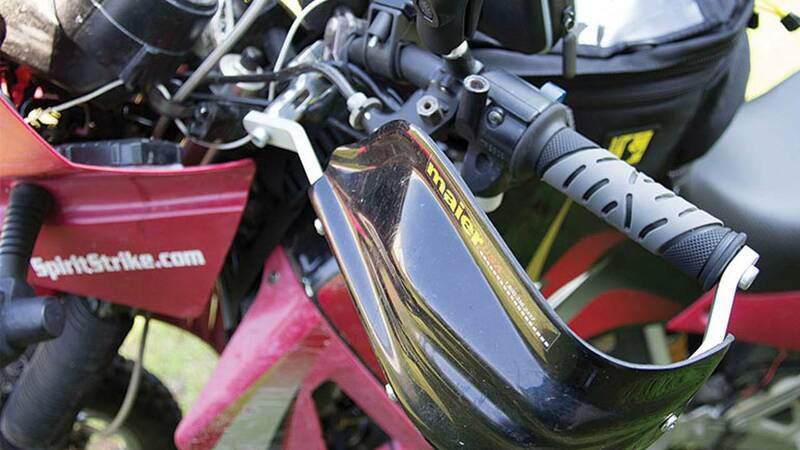 Handguards are your best bet to protect your levers, but there is another trick: Put a strip of duct tape around the handlebar where the lever clamps on. When you put the lever back, use thread locker and get it tight enough to hold still, but loose enough to rotate it. The thread locker keeps your screws from falling out and you have easily adjustable levers that can rotate in the event of a fall to avoid damage. With footpegs you need to be honest about where you’re riding. Adventure bikes often come with rubber footpegs from the factory. These are great to reduce vibration transfer, but once they get wet or muddy, they become slippery. If your boot slips off a footpeg at the wrong time you could end up hurt. 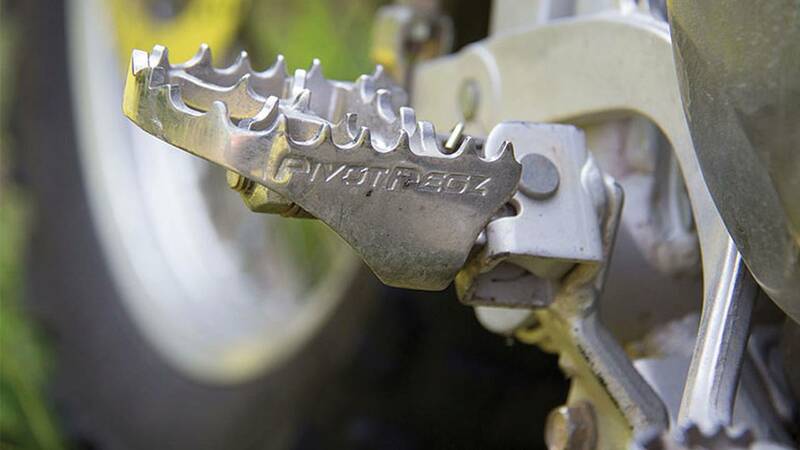 If you primarily ride sitting or on the pavement, keep your rubber footpegs, but if you like to get wet and muddy, consider some metal spiked footpegs like shown. I have used two versions of metal footpegs. The stationary pegs work great at keeping your boot on the pegs. One example would be these IMS pegs. The other type is a product called PivotPegz. These rotate forward and back. If you only ride on pavement or good forest roads you likely won’t see enough benefit to justify their cost, but if you take your bike on trails you will love them, especially if you are wearing motocross boots. Pivot Pegz allow you to keep your foot on the pegs when you are shifting. While on a steep incline your boot is still able to be flat on the pegs, providing an extra dose of confidence. You should always wear gear no matter the type of bike, but protective boots are vital on adventure bikes. Although, the problem with the bigger boots is they make it more difficult to get your toe under the shift lever. If you have to work hard to shift you need an extended shift lever. Moose makes an affordable one that adds an extra inch in length. 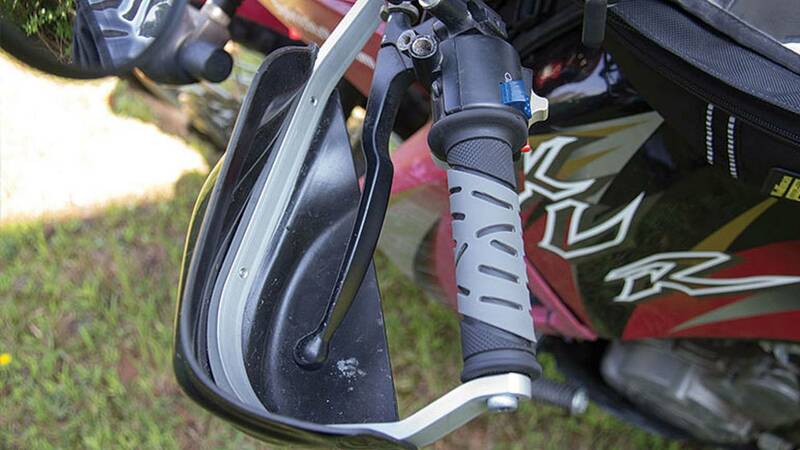 When you install your extended shift lever, experiment with the spline positions. I had to rotate my lever up about two splines to allow clearance for my boots. You need to make suspension adjustments to your bike to maximize performance. 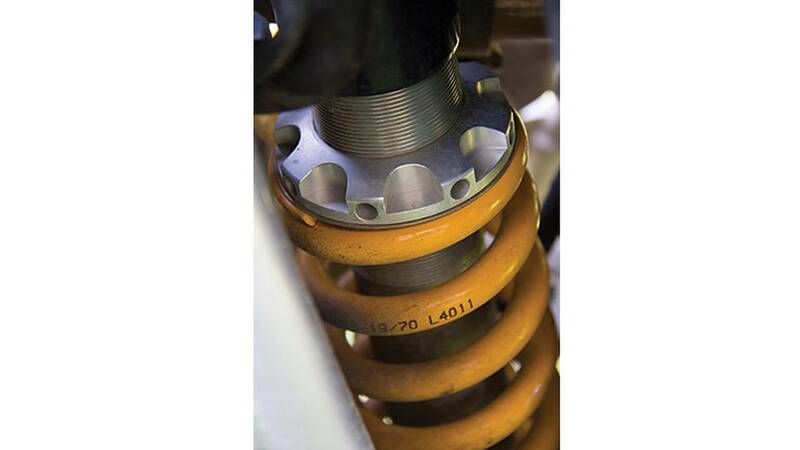 Manufacturers often set factory suspension up for people around 160-180 pounds. If you are heavier, you need to look at increasing the spring weight. Luggage will also play into your suspension setup. Hard boxes are heavier than soft luggage and people who camp off their bikes will carry more than someone taking a short ride. 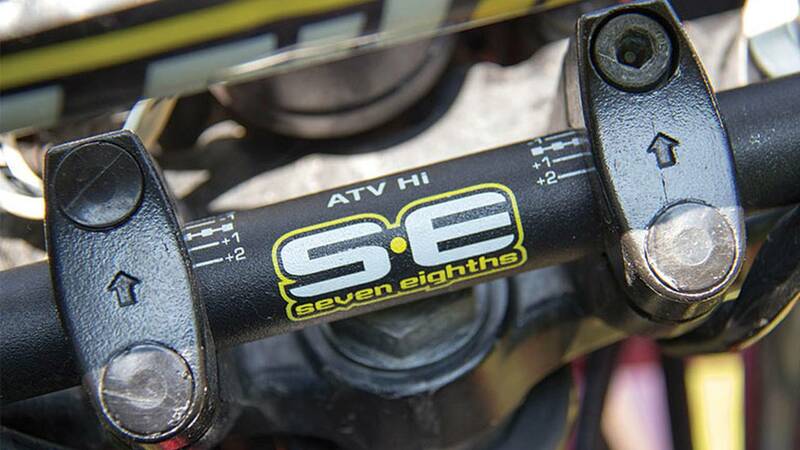 First, set proper sag so your suspension will be less likely to bottom out or top out. Tuning your suspension will make your bike more comfortable to ride and allow you better control. I chose to upgrade my forks and rear shock using Cogent Dynamics products. I highly recommend them. For long rides the seat makes a huge difference. If your bike is more dirt oriented, you likely have a narrow seat that feels like a piece of wood. If you have an adventure bike your seat is likely wider and softer. Wider seats make your long rides more comfortable, but if it’s too wide using your legs to control the bike will be more difficult. There is always a compromise. Corbin and Sargent make nice aftermarket seats. You can also get a DIY kit from Seat Concepts to save money. 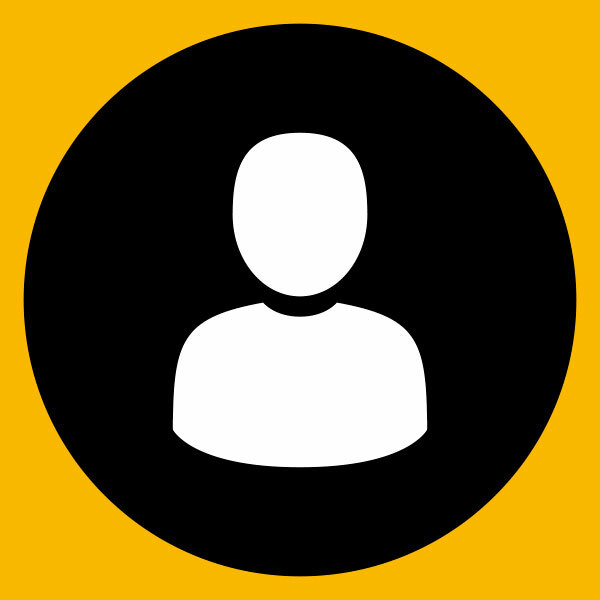 Try to find a seat that fits your personal style. I chose a Sargent low seat. It is narrow at the front and wide at the back. I chose the low seat because I am not very tall. I wanted to touch the ground better without lowering my bike. 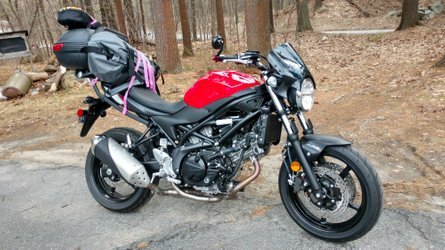 Luggage choices have a big effect on the handling of an adventure bike. If you are mostly riding on pavement you can go with hard boxes like SoloBox and get good crash protection with easy to use luggage. When you go offroad those hard boxes become a hazard. If things get out of control and you dab your foot down you risk getting your foot stuck and breaking a leg. Soft luggage is a safer choice offroad. The downside to soft luggage is how well it hauls. Having soft luggage attached firmly will make it feel like part of your bike. It will stay put when you are shredding the gnar, but if you don’t get it attached well it will flop around and feel like you have a passenger who fell asleep. I use a luggage setup that allows me to haul virtually anything. I use a Green Chile Adventure Gear Uprising Soft Rack with two NRS 38 liter dry bags for camping gear and some Wolfman Expedition Dry Saddlebags for day trips. My luggage adds very little weight to my bike and it is all waterproof. I have hauled my luggage on everything from single track to the interstate and I am convinced that I have found the perfect configuration for me. This article was intended to encourage you to find the perfect fitment for your adventure bike. Adjusting a bike for your riding style can allow you to ride faster, with more confidence. But, I'm sure we missed some things, comment below and tell us some of your methods for obtaining proper ergonomics.